Whenever I visit back home, I head over to Gulf Shores for lunch at Lulu’s. For those of you who may not know, Lulu is Jimmy Buffet’s “crazy sista”, Lucy. Lulu’s is a wonderful open air restaurant on the Intracoastal Waterway with great music, seafood and burgers. 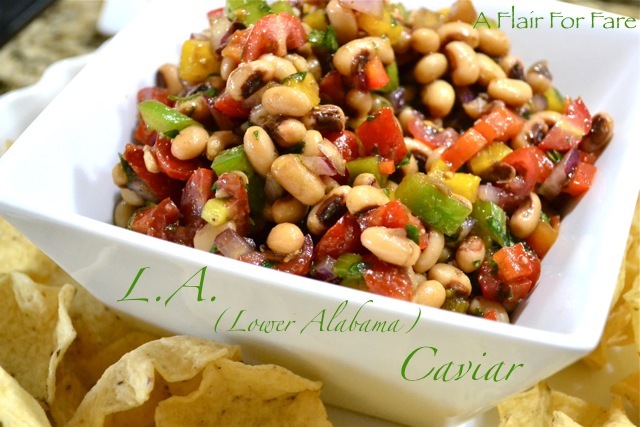 You’ll find lots of great southern fare on the starter menu too, and one of my favorites is her L.A. Caviar. It’s an awesome (and healthy) salsa made with black-eyed peas, bell peppers, red onion and tomatoes in a balsamic vinaigrette. Serve it up with tortilla chips or for a true southern experience, with saltine crackers. I serve it often at get-togethers and my guests love it. If you ever find yourself down in Gulf Shores Alabama, head on over for great food and great fun! Combine black-eyed peas, onion, peppers, tomatoes, parsley, vinegar, oil and sugar. Season with salt and pepper. Marinate for 12 to 24 hours before serving. Thanks, we have been fixing some of your recipes and adjust for vegetarian. In fact, just fixed your pasta with mushrooms and chicken last night-without the chicken. May try the below over rice and add onions. Thanks for posting. I wanted this recipe.